Easy to make without the bother of cooking beans from scratch. Goes great with pulled-pork sandwiches and bbq ribs! Be sure to make plenty for your next cookout, cause they’ll go fast! Cook bacon in large skillet until fat is rendered and lightly brown, about 5 minutes. Drain fat; save 2 tbsp. fat and cook onion, garlic, and ginger until onion is tender, about 5 minutes. Stir in beans, sugar, molasses, bbq sauce, ketchup, Worcestershire sauce, mustard, and vinegar. 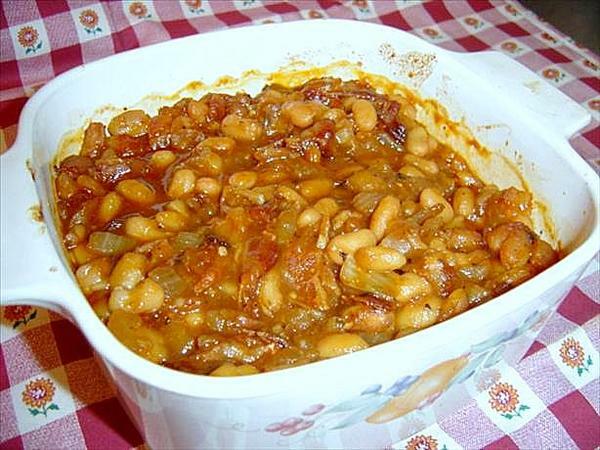 Place bean mixture in an oven-proof baking dish or casserole; bake at 350 degrees for 30 minutes or until thickened. Alternatively, they can be cooked on a bbq grill, away from the flames or coals, approximately 30 minutes, or until thick.